New Terminator Movie Will Be Just 'Terminator' | Nerd Much? Folks, we finally have a name for the upcoming sixth Terminator film. It’s been officially titled – drum roll please – Terminator. James Cameron announced the news during a CinemaCon event yesterday. Cameron isn’t directing the movie, but he is overseeing it as a producer. It’s the first Terminator film the Hollywood icon been directly involved with since 1991’s Terminator 2: Judgment Day. The next iteration of the series will be a sequel to Judgment Day. The creative team plans to ignore all other films in the franchise that took place after Terminator 2. Effectively scrapping the existence of Terminator 3: Rise of the Machines, Terminator Salvation, and Terminator Genisys from canon. Tim Miller (Deadpool) will serve as director on the movie. David S. Goyer leads the writing team on the project. That team includes Terminator: The Sarah Connor Chronicles creator Josh Friedman, as well as Justin Rhodes and Billy Ray. At CinemaCon, a promotion poster was on display featuring Linda Hamilton’s Sarah Connor. Hamilton is back to once again play a major role in the series. Arnold Schwarzenegger returns too as the iconic T-800. New to the franchise are Mackenzie Davis, Diego Boneta, Natalia Reyes and Gabriel Luna. Luna is expected to play the villain in the upcoming film. While Mackenzie Davis is rumored to be taking the role of series’ lead from here forward. There’s been no indication as to who will be taking on the role of John Connor, should the character even been in the movie at all. 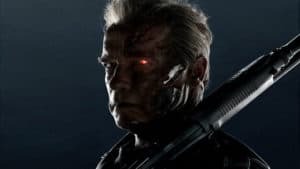 Terminator was supposed to hit theaters on July 26th, 2019. It has since been pushed to November 22nd, 2019 to avoid competition with the upcoming Fast & Furious spin-off, Hobbs & Shaw. Only time will tell whether Cameron and Miller can bring this iconic series back to its T2 glory days. But one would imagine that the franchise being back in Cameron’s hands is the best possible scenario.